Filtering by Category: "National Park"
The three days before Mother's Day four of us took a quick ride out to Big Bend National Park. Marco, Hiram, Tomas and myself left on Thursday morning about 5:45am under overcast skies with 80% chance of rain in the forecast. As we often do, we took the back roads way West with only us and a few thousand tractor trailers from the fracking fields cluttering up what were once lonely roads with great scenery. Now most of the highways are in terrible disrepair from the heavy tractor trailers going to and fro the fracking wells. Dilley's under the center pin! We headed northwest first toward http://www.motohank.com (Motohank's) so that Marco could get a new set of tires on his BMW RT. Hank owns the shop and he's a certified BMW motorcycle mechanic in Dilley, Texas. You'd think that he wouldn't have any business out in the middle of nowhere, but he's got a healthy clientle from both the Rio Grande Valley and San Antonio. Dilley is approximately 85 miles North of Laredo on I35 and 75 miles from San Antonio. It's approximately 230 miles from Mission, TX. About an hour before we hit Dilley it started to rain and soon thereafter we rode into a heavy shower. It rained most of the way into Dilley, but as we approached Dilley there was a cloud off to our West side that was so dark that it looked dark green instead of just black. As both cloud and riders raced toward Dilley it became obvious that the cloud won by a mere five miles or so. It really started raining hard, but it was no time to pull over as we knew we were close to Hank's shop. Again my waterproof BMW Motorad All Around gloves with the rubber visor wiper on the forefinger were a life saver. I was on my 2008 Harley Ultra Classic while Tomas and Marco were on their 2010 BMW RTs and Hiram on his BMW GS. My bike started to miss badly as water was sucked into the air intake, but I was able to make into Hank's covered garage area. It wasn't five minutes after we reached Hank's that quarter size hail started to fall. The whole scene was bleak, dark, wet and windy. We were just grateful we had made it safely and knew that we weren't about to rush off as Hank began the tire replacement on Marco's RT. We moved on from Dilley about 1pm headed Northwest toward Uvalde and then West on Hwy 90 to Brackettville. Brackettville is home to the movie set "The Alamo" filmed in 1960 starring John Wayne as Davy Crockett. From there we continued West to Del Rio where we stopped at Rudy's BBQ for a late lunch. By the time we left Rudy's it was starting to rain again. We flew by Langtry and rode into Sanderson for fuel before moving on to Alpine. The rain finally started to clear up in Sanderson and dark skies began giving way to some sunlight.We rolled into Alpine about 8:20 in the evening still with our rain gear on, but it had stopped raining most of the way between Sanderson and Alpine. We met up with a rider on a BMW GS from Houston named Andy. He rode into Alpine about three hours ahead of us and asked if we ran into the hail before Sanderson. We hadn't, but Andy said that it covered the highway for about 300 yards or so approximately ten miles before entering Sanderson. Thinking he was just seeing a water reflection on the highway he rode into a layer of hail between an inch or two thick. Andy said he'd figure he was going to lose the bike, but managed to keep it upright and slow down in order to slowly pass through it. Friday morning Andy was headed out to Terlingua to camp out a couple of nights, but we mentioned that camping at the Chisos Basin within Big Bend National Park was a lot better than Terlingua. We spent the morning in Alpine before riding about 82 miles South on Highway 87 down to Study Butte and Terlingua. 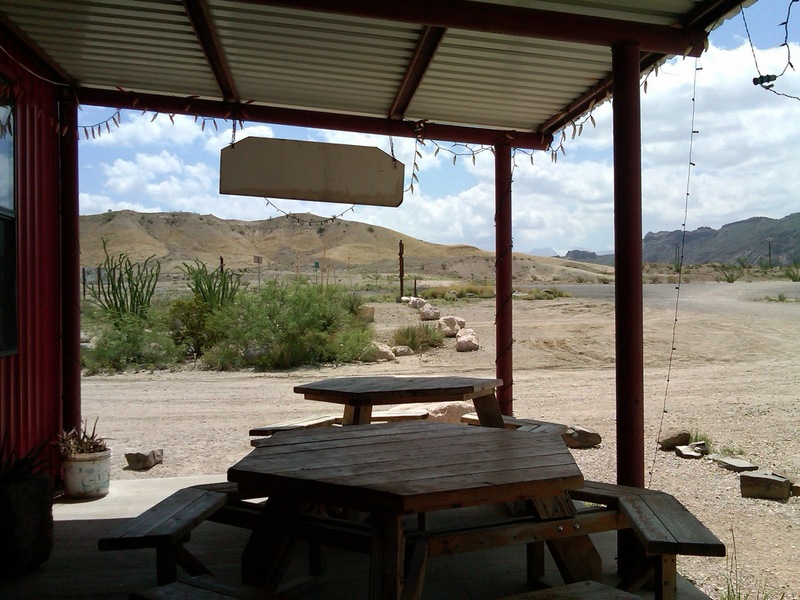 Study Butte and Terlingua are at an elevation of 2,582 feet so its sometimes really hot especially around July. Compared to Alpine at 4,500 feet and the Chisos Basin in Big Bend at 5,400 to 5,700 feet which are much cooler Terlingua is usually very warm. It's an interesting area with its share of interesting people much like Marfa with its art community. After a short rest we entered Big Bend National Park from the West entry which lies just a couple of miles outside of Study Butte. Unlike the North entrance, the Western entrance is more stark and moonlike looking with weird rock formations that don't look like they can support much life, especially not livestock. A few miles further into the park is the lone entry booth and this time it was actually open with a female Ranger charging an entry fee. That's kind of rare, seeing anyone in that booth since its about 26 miles from Panther Junction where the Park Headquarters is located. I flashed out my senior pass and driver's license and went right in. We headed to the Chisos Basin 30 miles away at the posted speed limit of 45mph. We rode around the basin campsites and picked out one with a nice flat area which would hold our three tents. It was within about 25 yards from the host park ranger (a volunteer position). We quickly made friends as we introduced ourselves. As it turns out, the Ranger, Rick Trimble a retired school teacher from Plano High School District. He was orginally from our neck of the woods, La Feria in the Rio Grande Valley; small world. We also met up with Andy, our friend from back at the Best Western in Alpine. Andy joined us for dinner at the Basin Cafeteria where we each had a few Shiner Bocks and we took two bottles of wine back to the campsite. Andy and Rick joined us as we enjoyed our wine, the sunset and just general chat about riding and camping out. It was one of those times where you say, "it doesn't get better than this!". As Andy and Rick retired for the evening we just stood out by the tents looking at the millions of stars that we just can't see from the city. We were up at daybreak and breaking down camp as we readied ourselves to leave after one quick night at the park. We rode out about 8am and headed north exiting the North entrance and making our way to Marathon about 80 miles from the basin. We had breakfast at the Coffee Shop on the West side of the Gage Hotel (I have a blog piece on the Gage Hotel). Coffee and breakfast was great as we sat outdoors next to a group of birders trying to imitate the Great Horned Owl. I tried to help out with the Three Amigos bird call, "loook...up...here.....loook...up...here". They didn't get it. We had to make up some time in order to get back for Mother's Day so we rode hard without any lengthy stop until we made it to Hebbronville where we stopped at the local Dairy Queen. We rode up on Thursday logging in approximately 678 miles, only about 120 miles on Friday and another 650 or so on Saturday. It was too short a time, but a great ride. Can't wait to do it again! 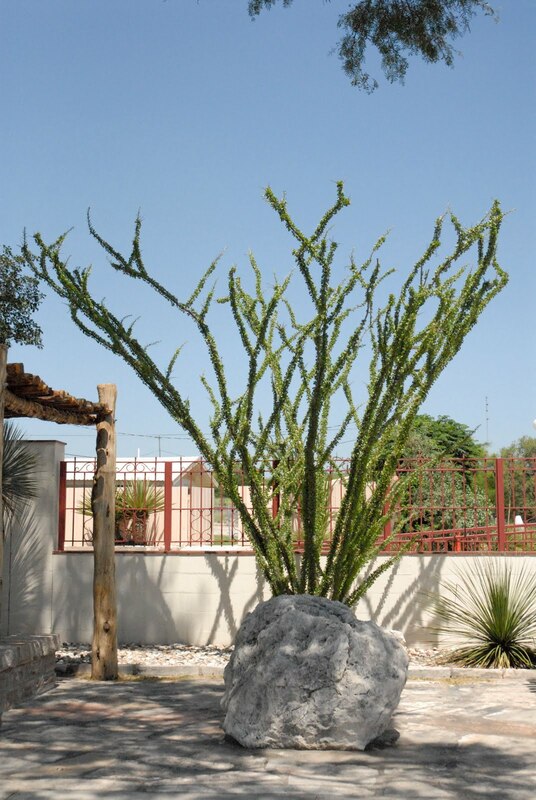 categories "BMW", "Big Bend National Park", "Harley Davidson", "National Park", "Touring", "Wolfman"
Just as you head out of Marathon, Texas is the Marathon RV and Motel and that makes for a perfect stopping place for riding into and around Big Bend National Park. Marathon is situated above the Big Bend National Park's North entrance. It's still about 45 miles due South before you get to the park entrance which is just an entry booth that's more often than not never staffed and it's about halfway to the Park Headquarters so just keep riding South. Total miles from Marathon to the Headquarters is about 80. The first half goes at a fast clip, but once you enter the park things slow down as radar enforced speed limits max out at 45MPH; about an hour's ride to the headquarters from the park's entrance. The park's headquarters is fully staffed and a good place to stop for a break, pay your park entry fee, and load up on free maps of the park. Most riders I know that ride into Big Bend have never taken the time to hike any of the great trails in the park. My recommendation would be to go early in the morning before 10am and locate a camping spot at the Chisos Basin camp grounds and stay at least two nights. The basin also has hotel type rooms about a half mile from the camp grounds, but those have to be booked long before your trip. Once you're settled into a camping spot you can take time to do a little hiking. The Window is probably the shortest and best hikes you can take. It's about a two mile hike and it's easy walking, but the way back is more difficult since you're walk uphill. Another good hike, but more of a medium duty walk, is The Lost Mines Trail which is about 4.8 miles and it starts at about an elevation of 5,800 feet. This hike offers some of the best views of the park and worth doing if you're staying at the park for more that one night. 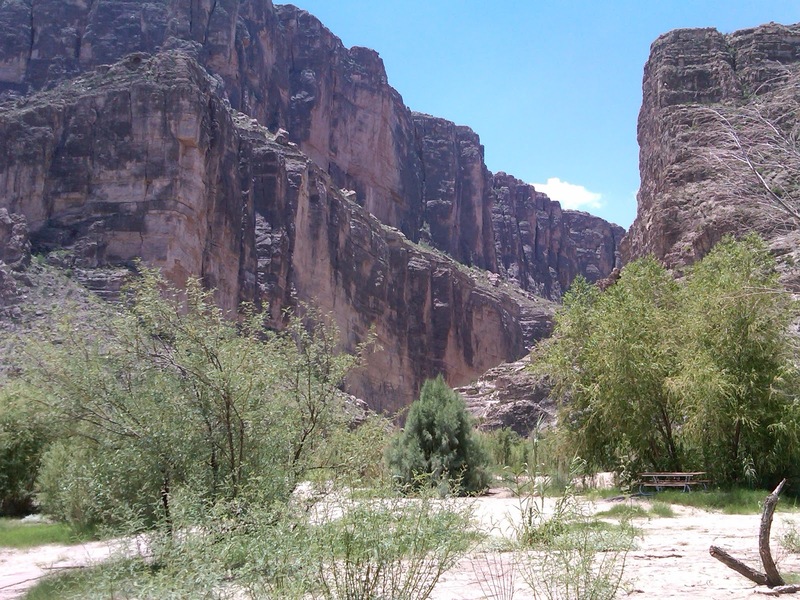 My third hike would be the one at Santa Elena Canyon. It's at the southern most part of the park, about 40 miles from the Chisos Basin camp grounds, but it's a nice ride unless its July then it can get really hot as you descend from the basis. Temperatures changes can be dramatic. 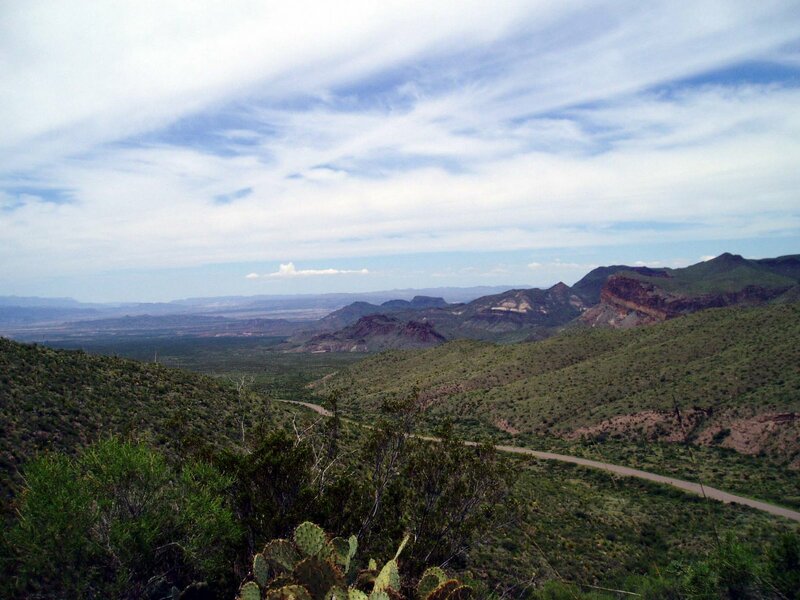 Halfway down to the canyon is the Sotol Vista Overlook, its a short loop off the main road, but a must stop. The overlook offers a majestic view of the southern park of the national park. Off in the distance you can see Santa Elena Canyon. Right before arriving at the canyon is Castolon Station, a must stop for water, snacks and just rest. It may be closed during the summer months so it's a good idea to carry water on your bike just in case. 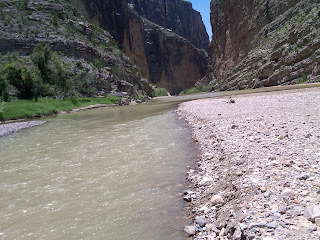 About six miles from Castolon sits Santa Elena Canyon. 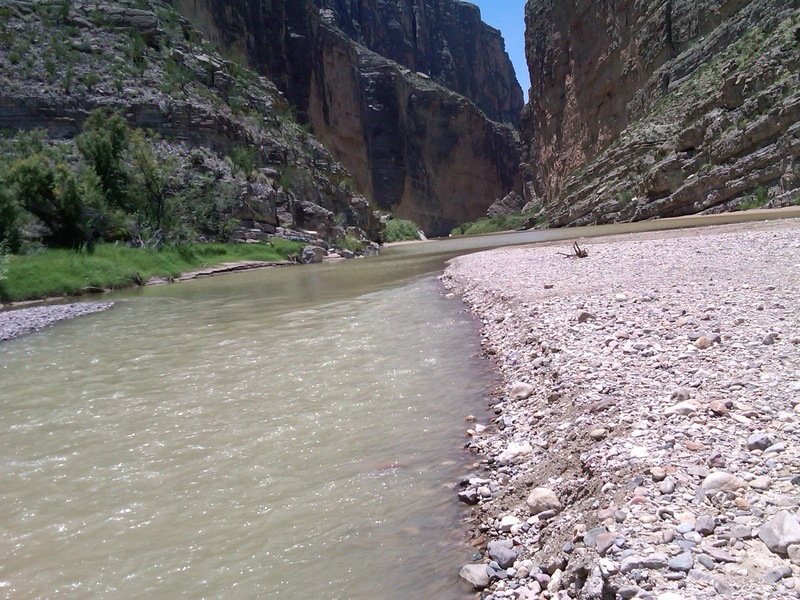 There's a parking area, restrooms some picnic tables and a short hike away is the Terlingua Creek that many people confuse for the Rio Grande River. Unless there's been a rain storm its easy to wade across the ankle deep waters of the creek to get to the mouth of the canyon and it's hiking trail. The trail is part of the park's trails so its easy to climb, but it is a vertical climb of about a 100 feet as you get a great view of the Rio Grande River, the creek, and the park to the north. I've been there half a dozen times or more, but have been turned by high waters cutting through the road those last eight miles between Castolon and the Canyon. As you backtrack out of the canyon road its best to exit on the western side of the park. It's about 40 miles from the basin to Study Butte and Terlingua. Both of these towns are very hot in the summertime so a mandatory lunch stop is not a bad idea. It's 82 miles to Alpine if you're headed north. You're now out of the park and can head 17 miles southwest to Lajitas. That's the town that was bought by some millionaire who turned it into a very spiffy upscale rural village. I've only stopped there once and that was enough. 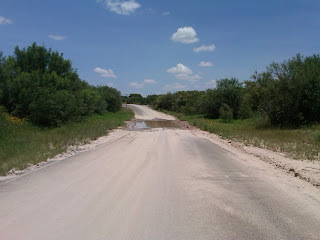 Its best to keep moving toward Persidio a 50 mile ride that hugs the Rio Grande River most of the way. Its a great twisty road known as the River Road that is worth riding in both directions since they both offer a unique riding experience. 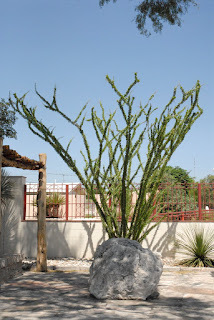 Persidio is just as hot as Terlingua, but much bigger. It's got lunch places, gas, and a large grocery store. Marfa lies north of Persidio. Marfa has become somewhat of an artist colony so it offers a nice mix of West Texas town and New York City in a twisted sort of way. If you like art then spending the afternoon in Marfa is well worth the stop. From Marfa its not a bad idea to east into Alpine and/or Marathon as a wrap up to a good day's riding. Another good ride is to head out to Fort Davis which has a great State Park with camping and a lodge and further northwest is the famous McDonald's Observatory. I'll cover those in another post. categories "Big Bend National Park", "Harley Davidson Motorcycle Touring", "Mexico Motorcycle Touring", "National Park", "Touring", "motorcycle touring"
Wyoming has to be one of the most beautiful states in the union. We started our ride just 25 miles south of Deadwood, South Dakota from a little town named Nemo. We stopped for breakfast in Deadwood before hooking up with Hwy 90 West toward Sundance then Gillette, Wyoming. We stayed on Hwy 90 until we hit Hwy 14 and continued on to Greybull and finally Cody, Wyoming. Cody is all Cowboy town and during the summer there's a rodeo every night. It's nice just to walk downtown and find a good place to eat and drink. We went for drinks at the Irma Hotel built in 1902 by Buffalo Bill and named after his daughter. It has a classic cherry wood bar that is still in use today. We spent the night at a Holiday Inn Express and a couple of the guys camped out at the KOA camp at the entrance of town. We were up for breakfast early and as it happened, we met the chef there at the hotel who asked where we were headed. After we said we were headed into Yellowstone he suggested that we stop at his parent's place in Cooke City, Montana. So we left Cody and took the famous Chief Joseph Highway as we headed to Cooke City and then on to Yellowstone National Park. The Chief Joseph Scenic Byway follows the route of Chief Joseph and his tribe as he successfully eluded US Cavalry troops in 1877. His route ran through Yellowstone and into Montana. It's a beautiful highway that's a must motorcycle ride. Once we arrived in Cooke City, Montana it wasn't hard to spot Buns and Beds restaurant which was owned by the parents of the chef we met back in Cody. We had a good time enjoying the great burgers they made for us and talking about their annual snow fall. They mentioned that they get hunters in winter and campers in the summer time so they stay busy. From Cooke City we entered Yellowstone National Park and made our way to the northwestern corner, a place called Mammoth Headquarters. It was obvious we weren't in Texas anymore as huge elk roamed the grounds without a care in the world. We went out to the campgrounds and secured a spot for ourselves and then went back to the headquarters to wait for a couple of the guys that had taken a detour from our route to Red Lodge, Montana so they were a couple of hours behind us. Once we joined up we settled into our campgrounds and setup our tents. I have a Marmont two person tent, but we managed to squeeze in four of us into it for a good night's sleep. Our Marmont sleeping bags are rated at 30 degrees so we slept very comfortably just a little tight. We really enjoyed the many wonderful scenic views in the park. Yellowstone is so beautiful that we can't wait to get back there and spend some serious time camping out. Of course, we took the loop road around the entire park and made the mandatory stop at Old Faithful. As you can see by the picture, it's still working, almost like clockwork. That area of the park is obviously the most popular, thus it's by far the most crowded area of the park so we were glad to get away from the crowds once we enjoyed a good lunch at the headquarters. We took a nice ride around the entire park except for one section that was closed by an ongoing forest fire. As a matter of fact, there were several fires ongoing during our ride. After we exited on the East side of Yellowstone it wasn't long before we ran into another forest fire. This one was really close to the highway. At one point it was within a couple of hundred yards from the highway as we had to slow down to a crawl as a helicopter crossed right in front of us and hovered over a stream running parallel to the highway. It hovered over the stream as it drew water up into its tanks to dump on the fire. It was soon off and headed back into the fire. That moment as it flew low over the highway in front of us and hovered over the stream looked surreal. Needless to say there was lots of smoke and it took many miles for us to get away from the smoke and back into clear skies. We made our way back to Cody for another night's stay before heading back to South Dakota. We left Cody and headed on a different route back to Nemo. We headed South to Ten Sleep and then into Big Horn National Forest via Highway 16. That route was nice and not as crowded as the traffic on the Interstate Highway. Yellowstone National Park is worth a camping trip and the rest of Wyoming is a wonderful state to tour. Our visit was way too short and we'll try to make it back there this summer. Motorcycle travel is fairly easy and we didn't encounter any problems. Once a coke truck broke down and we had to make a stop at an awkward incline, but once we got through that spot everything else was routine two-up riding. Fire Fighting Helicopter Getting Water! categories "Harley Davidson Motorcycle Touring", "National Park", "Touring", "motorcycle touring"
Most visitors to Big Bend National Park seldom take the time to make it all the way to Santa Elena Canyon on the southwest corner of the park. It's one of the most interesting parts of the vast environmental diversity found in the park. If you're coming in from Alpine, Marathon or even from a campsite at the Chisos Basin within the park you'll notice that it can be very hot down by the canyon. My wife and I have camped out at the basin with temperature about 80 degrees and by the time we reach the canyon it was 20 degrees hotter, a 100 degree day. On a motorcycle those 20 degrees are light years apart on the comfort level so be prepared to peel off layers of clothes as you approach the canyon. If you go into the park via Study Butte on the western end of the park the turnoff to Santa Elena Canyon is about 13 miles away. The ride is about 30 miles from the turnoff. About one third of the way down is the Sotol Vista Overlook. Don't pass this up, the ride is less than half a mile and worth the stop to take in the view. Santa Elena Canyon is in view about 12 miles away as the crow flies, but another 20 miles or so on the road. Friends with a BMW GS or other worthy off road bike can circumvent this route by taking the unpaved "Old Maverick Road" that hugs the western boundary of Big Bend National Park and cuts the travel distance in half or more. Old Maverick Road is a 13 mile ride to the canyon. Eight miles before reaching the canyon is Castolon Visitor Center. It's a must stop if its 100 degree weather. There's water, soft drinks, snacks and usually a great person behind the counter ready to share some time with visitors. Over the years we've met several workers stationed at Castolon and you really have to admire their dedication to their job and the National Park Service. Talk about being stationed away from civilization! This is it. Another eight miles down the road is Santa Elena Canyon which is not always accessible. If it has rained then, most likely, the road is impassable to traffic at anyone of the numerous low water crossing those last few miles. We once went about three straight visits to Castolon only to be turned around due to high water. 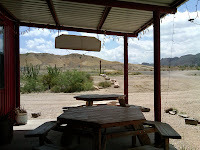 There is a turn around at the end of the road and about 75 yards from there is a sandy walk to Terlingua Creek that merges into the Rio Grande River. If it's not raining or rained the night before you can walk across the creek and meet up with a steep path that runs almost a mile along the canyon wall above the river. It's a very nice hike if you can cross the creek. If you are already in the park then plan to spend at least a half day to enjoy the canyon. Remember it takes about an hour to get there, then a rest stop at Castolon, and at least an hour or two at the canyon makes for a long day trip. There is also Mule Ears Viewpoint which you can see on the way back. An even longer day is if you're in Alpine, 82 miles from Study Butte or Terlingua so plan accordingly. It's just as far from Marathon if you enter from the north entrance. Big Bend National Park gets over 300,000 visitors a year, but I know that's not in July. We've been there during the summer months and its fairly void of other humans so you have the whole place to yourselves. Did I mention it gets hot? Last summer my wife's shoe literally melted apart so plan ahead and take sun screen, water, more water, and snacks. April and May are good months to visit since its still a little cooler. There's also rafting trips you can take down the river from Lajitas. It used to be a really neat old town, but somebody bought the whole town and gave a Gucci type remake. It has fancy stores, a golf course, and even an airport landing strip for private jets. We've ridden through it many times and we even stopped once. Sotol Vista Overlook Parking - Not Too Crowded in July! July is hot enough to melt your shoes off! categories "Big Bend National Park", "Harley Davidson Motorcycle Touring", "National Park", "Touring"
I'll admit I'm afraid of heights and even though riding to the top of Mt. Evans Scenic Byway was a real rush it's not something I'd like to do again! In a four wheel drive vehicle it would be great, but it will still have you holding your breath on some of those hairpin turns. It's something I'm glad I've accomplished, but it was never on my bucket list of must things to do. Mt. Evans lies west of Denver and its narrow road, without guard rails and with dramatic drop offs and snow covered sides lays claim to being the highest paved road in the North America. Our ride started in the Rio Grande Valley of South Texas in June at 5:30 am on a typical day in South Texas, a perfect morning soon to get hot. There were five of us riding, Marco Gutierrez a local physician who lives in Edinburg riding a BMW GS, his brother David who flew in from Florida and had his Yamaha at Marco's house ready to ride, Ed Ramirez a computer programmer at the University of Texas at Pan American from Alamo on his 2010 Harley Davidson, my brother Tomas Perez on a Honda ST 1300 and myself riding my 2008 HD Ultra Classic. We decided to avoid the major highways on our trip to Colorado by riding along the less frequently traveled roads or what we call the back way to West Texas. It's a lot quicker ride if you stay on the interstates, Highway 281/37 to San Antonio then I10 West with speed limits at 80 west of Kerrville. Our more pedestrian route first took us to Hebbronville on Hwy 1017 via McCook and San Isidro. From Hebbronville we took Hwy 16 North to Freer before turning northwest on Hwy 44 to Encinal then north on Hwy 83 to Carrizzo Springs and on to Del Rio, 300 plus miles from Mission. It was lunch time and we stopped to eat at Rudy's BBQ. West of Del Rio is the Pecos River and Langtry, home to Judge Roy Bean, Law West of the Pecos fame. The bridge crossing the Pecos is the highest suspended bridge in Texas and it crosses the Pecos right before it merges with the Rio Grande River. We stopped at the Overview park to check out the view of the Pecos River, the bridge and off at a distance to the South the Rio Grande River. It was over 100 degrees in Langtry, so we stopped at the very nicely built Texas Department of Transportation (TxDot) Travel Information Center. It's home to the historic saloon of Judge Roy Bean and just about every publication at the center is free including complimentary copies of Ride Texas Magazine. Langtry is like an oasis in the desert so it's worth the stop. On the road again, its now hot enough to make you think about how great tires are that they can roll mile after mile on pavement that's got to be at least 115 degrees without melting. You don't think about that in a car, but it sure crosses your mind on a motorcycle. Being partial to a tire manufacturer dedicated to motorcycle tires, I run with Metzeler and like their grip in the rain. We continued west along Hwy 90 to Sanderson, a town with two noteworthy gas stations. There's a popular big gas stop at the western end of town and on the east end of town a small gas station with a shaded picnic table that makes for a good soda break. I'm not sure why Sanderson is out there, maybe because of the intersection on Highway 285? It's this highway which we took as we headed 65 miles northwest to Fort Stockton. Fort Stockton is on I10W so it gets traffic running between El Paso and San Antonio especially truck traffic. We crossed Fort Stockton still headed northwest toward Pecos, another 55 mile jog. Pecos is usually very hot and dry, but we were lucky to hit a thunderstorm as we rode into town. The welcome rain cools us off for the rest of the day. Pecos is not suited to handle much rain and the streets were quick to flood. We weren't far from the Land of Enchantment, New Mexico so we pushed on. It was getting late in the afternoon so temperatures started to cool off as we entered New Mexico. There's a dramatic drop in speed limits going from Texas to New Mexico from 75mph to about 60mph. That's pretty unbearable on roads with little or no traffic so we ride at a conservative 73mph as the GPS reads. We rode past Carlsbad as the sun set and stopped for the first night close to Lakewood at a local KOA Campground. It was a good first day's ride, approximately 742 miles, and ready for dinner. Day two was a much cooler day. We took some back roads toward Roswell where we stopped for breakfast at Denny's. Western New Mexico is fairly flat and the winds can really blow. We rode through some strong cross winds and luckily squeaked through threatening thunderstorm clouds that made the storms back in Pecos look like a spring shower. Traveling northwest we stopped for a couple of hours in downtown Santa Fe. We had a light lunch at the French Pastry Shop & Creperie by the plaza. They have great pastries and good coffee, a must stop if you're in the area. We continued our ride through Santa Fe and headed north toward Pagosa Springs, CO and the San Juan National Forest. Cross into Colorado and the landscape turns emerald green a sharp contrast from the desert sands of West Texas and New Mexico. From Pagosa Springs we headed west to Durango and ending our second riding day. We had crossed the entire state of New Mexico, an easy 500 mile day compared to our first day's ride. Durango, Colorado is home to the Narrow Gauge Railroad that runs between that town and Silverton. It's a popular ride and one I had taken many years ago when my kids were younger. The scenic ride meanders through the mountain passes to Silverton. Silverton, the only scheduled stop, offers enough time for shopping and lunch before heading back to Durango. We stayed at the Holiday Inn Express and got a late start because I wanted to wait for the local Harley Davidson shop to open so I could buy a heated vest. Seems I packed long sleeve shirts, but not nearly enough warm clothes for the upcoming days. We would experience temperatures as low as 36 degrees on our trip, a dramatic difference from the weather in Langtry! Finally, late that morning we rode west to Mesa Verde National Park. The cliff dwellings of the Pueblo people date back to 600AD and it's good ride. The terrain flatten out as you go west and things warm up a bit. We backtracked to Durango and headed north to Silverton then Ouray. Ouray is known to some winter tourists that visit us in South Texas as the little Switzerland of the USA. Having never been in Switzerland I have no clue as to the truth of that statement. Ouray is nestled between some fairly big mountains leaving you the sensation of being in a bowl. We continued north to Montrose, but decided to double-back south to find Ridgway State Park near Ridgway where we wanted to camp for the night. We pitched our tents, made a fire, and chatted into the night before getting into our sleeping bags. It was 46 degrees that night so our sleeping bags were perfect for a cool night. I've always camped with our Marmot sleeping bags rated at 30 degrees and our Comet two person tent from Sierra Designs. The Comet has extra strength poles for those windy nights. Both of these come from REI online orders. Ridgway State Park is rated as one of the top ten state parks in the United States. If you walk to the top of a small hill there's a beautiful view of an adjoining lake. We had two campsites, but decided to group our three tents on one site and got in trouble for that. We used one site to park the bikes and another to camp, but park rules limit the number of tents to two per site. Who knew? The Park Rangers at Ridway State Park, yes, the same ones that got after us for too many tents on one site were very good in offering us travel recommendations. They recommended we stop at the Black Canyon mentioning that most people don't even realize its there and its often overlooked even though its a great place to visit. We took their advice and headed in that direction. We had an early brunch in Montrose before heading to the Black Canyon of the Gunnison National Park then back on the road headed east toward Gunnison. We rode Hwy 50 east to Poncha Springs then north on 285 to Buena Vista. North of Buena Vista we caught Hwy 82 and headed northwest to Aspen. Highway 82 is a narrow two lane road that eventually makes its way to Aspen. The weather was overcast and threading to rain, but we made it safely to Aspen. After walking some of the downtown streets in Aspen we decided that it's not for us so we ride on. Next came Carbondale then Glenwood Springs before getting on I70E and headed to Vail. We stopped for the night at one of the many hotels on I70. The next morning we continued on I70E headed for the base city of Mount Evans, Idaho Springs which is about 45 minutes west of Denver. Idaho Springs was a welcome site, unlike Aspen or Vail, this town had regular stores and restaurants and just regular working class people. We had been on I70 with typical traffic congestion, but still a beautiful ride as expressways go. After a short break in Idaho Springs we started on Hwy 103 to Echo Lake. Echo Lake has a nice gift shop and restaurant and I don't know if its best to stop there on the way up or on the way down, but I would recommend making that stop on the way down. Weather changes can be sudden and dramatic especially in the late afternoons so it's best to get the ride out of the way before it gets too late. On the way down the Echo Lake stop seems like you're safe again, so stop and get those bumper stickers that say you made it to the top of Mt. Evans. On the way up those decals seem expense, but on the way down they seem like a real bargain. We started our climb about noon with clear skies. It had been in the 70s down at Idaho Springs, but it was now getting cooler. Just beyond the Echo Lake stop is the official park entrance. An entry fee of about $10 is required. The park road is very different than the highway leading up to Echo Lake. It's much more narrow and the tall forest trees are much closer to the road than down below. The road has a steady climb, the terrain slowly giving way to less trees and suddenly you are above the tree line. Being scared of heights made me tighten the grip on my handlebars, focus on the road and not on the sheer drop-off just a few feet away, and a fixation on my Garmin GPS's altitude gauge. I knew that the switch-backs would end at 14,130 feet so I kept glancing at the GPS wondering if it was really right. The switch-backs literally make 180 degree turns. Keeping the bike upright as you navigate each turn was a challenge. The altitude displaying on my GPS was moving fast, but to me it seemed too slow for me. After every turn around the bend there was more road in front of us, always leading up. Eventually we could see the lookout building and knew we were making it all the way to the top. The temperature was now between 36 and 39 degrees. It was difficult to breath and my heart was really pumping. I think its natural to breath more rapidly to get more oxygen in your lungs. I was wrong and realized that when I read the informational sign telling you to stay calm. View from top of the highest paved road in North America! Knowing what lay before us, the ride back down the mountain was very welcome. We could relax and enjoy the view knowing that every turn got us back closer to planet earth. Once we were back at Idaho Springs we made our way West on I70 and turned north on Highway 40 heading to Grandby. We took the Trail Ridge Road 34 across the Rocky Mountain National Park to Estes Park. The Trail Ridge Road was another high altitude adventure as we crossed the Continental Divide again on our crisscrossing ride in Colorado. Of course, this road was tame compared to the Mt. Evans adventure and the inclines on the cobblestone roads of Real de Catorce in Mexico. Rocky Mountain National Park gets over three million visitors a year and I can understand why as you travel the Ridge Road you will see wildlife like huge elk, green meadows in panoramic views below your road elevation, and snow in the summer. Estes Park is another great park that serves as the East entrance to the national park. It makes for a great camp base before heading into the national park. We spent our last night in Colorado on the outskirts of Boulder and so ended our rocky mountain ride. We headed out of Colorado via Hwy I70E across the eastern part of Colorado. As we headed east we made Salina in Kansas then south to Wichita and pressed on to Oklahoma City. It was a long day's ride logging over 700 miles. The next day we duplicated our miles by doing another 700 plus mile ride home from Oklahoma City to Mission, Texas. By the time we hit the Texas state line we were back in hot weather and our heavy jackets and electric vests were somewhere deep in our saddle bags by then. We rode over 3,200 miles on our trip and crossed West Texas, New Mexico, Colorado, Kansas, Oklahoma and Texas again, but north to south. We averaged about 500 miles a day at speeds between 80 and 5mph. We weathered temperature changes from 100 degrees to close to freezing, crossed the Continental Divide, camped out, visited several National Parks and got to see the great outdoors. Yep, we're at 14,130 feet! categories "BMW", "Harley Davidson", "Honda ST", "National Park", "Touring", "motorcycle"
Laguna looking north up the bay! SPI in the distance directly across the bay. Sunset on the West side of Refuge. From the scenic overview tower South Padre Island is visible across the bay. As a matter of fact you can see Port Isabel, the causeway, and SPI. It's a spectacular view and judging from the little traffic it's a view few people get to see. Ed Ramirez, Tomas Perez and I rode together and stayed through sunset before heading back home. categories "BMW", "Harley Davidson Motorcycle Touring", "National Park", "Touring", "Wildlife Refuge"
categories "Big Bend National Park", "National Park", "Touring"